Welcome to our Gene dolls fashion store! Gene dolls, Madra, and Violet Waters - fresh and stylish with a sense of fun and excitement! We offer the Gene Doll Collection by Mel Odom for Integrity Toys and older Gene dolls, costumes and accessories for Ashton Drake with Free Shipping! Entire site - Buy 1, Get 1 Free! Gene Dolls: More than ten years after taking Hollywood by storm, Gene Marshall's star is shining brighter than ever. 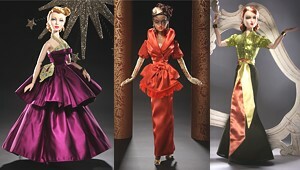 Fans continue to clamor for Gene Marshall dolls and her friends fashion dolls. And Madra returns this year for her encore performance as Gene's arch-rival! Gene dolls are fresh and stylish and presented with a sense of fun and excitement. Enjoy collectible Gene dolls, Violet Waters dolls, Madra dolls, and Trent dolls and the great art that has created these beautiful fashion dolls. Share the dream with Gene dolls!